Before the days of film, the magic lantern was an important source of entertainment, using glass slides to create moving images and visual tricks. Birmingham played a key role in this pre-cinema world, producing thousands of lanterns for export, leading to the birth of the flipbook, and eventually the cinema. The Library of Birmingham boasts a hefty archive of 60,000 lantern slides, and to coincide with the Magic Lantern society’s annual conference in Birmingham, Flatpack Festival presents Box of Light, a weekend full of events, workshops and activities celebrating early cinema, part of the Capsule curated Discovery season. An evening of edification and entertainment featuring acclaimed performer Professor Heard, followed by the Physioscope, a Victorian experiment with light and mirrors. The finale of the show is provided by French artist Julien Maire, whose Open Core performance includes a live dissection of a video projector. Beautiful and intimate theatrical performances using paper cut-outs and miniature projections. 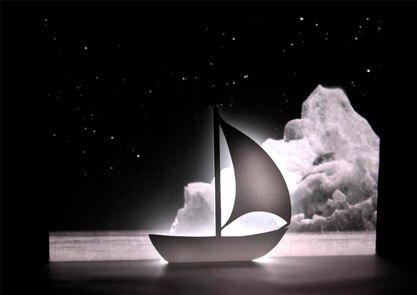 The Icebook will delight small audiences using old pre-cinematic illusions and magic lanterns; to create shadows and silhouettes complemented with a film footage backdrop. Designer Benjamin Redford will be giving a talk about his ingenious miniature slide projector. In response to modern technology and the craze for Instagram, Benjamin has created a tiny projector to share Instagram pictures called the ‘Projecteo’. This analogue approach works by creating wheels of slide film to hold up to 9 images, which can be watched and enjoyed as a slideshow. Mirror Mirror will host an array of free family workshops, where visitors will have the chance to create their own lantern slides and experiment with colour projection. Box of Light’s weekend is set to include more talks and activities and a comprehensive walking tour of key locations in Birmingham’s pre-cinema history. Watch this space for updates. Tickets for the Box Of Light variety show are now on sale via birmingham-box.co.uk.